Posh striker Tom Nichols has been asked to learn from Billy Sharp and Lee Gregory. Manager Grant McCann believes Peterborough United will need to win at least seven of their remaining 11 League One games to extend their season into May. It’s a tough ask for a team who have won just four of their 12 League games in 2017, but it’s one McCann believes his players can pull off. Posh manager Grant McCann applauds the travelling fans at Millwall. Even then it might not be enough. Posh are currently eighth and if they manage to win at fifth-placed Bradford City on Saturday they will be just three points behind the Bantams. But there are teams with games in hand queuing up to overtake Posh. Most notably in-form Oxford United who are just a point behind McCann’s men and have three games in hand. McCann said: “The way things are going for us right now we could well win six of the last 11 matches as we seem to be winning one and losing one. Posh skipper Chris Forrester could return to the starting line-up at Bradford City. “But I suspect we will need more than that. We could need to win seven or eight of them.There are several teams, even some below us, who will fancy their chances of finishing in the top six. “I honestly feel we still have a good chance. Obviously we need to develop greater consistency and we need to win some of the close games, but we are still travelling to face another good side in a confident mood. “Bradford have had a good season under Stuart McCall. They were very impressive when they beat us at our place early in the season and they seem to have been in the top six all season. “But we have played okay in the last two matches and if we can just convert a greater percentage of the chances we do create we will have a chance. “I’ve asked Tom Nichols, Lee Angol and Junior Morias to watch how players like Billy Sharp (Sheffield United) and Lee Gregory (Millwall) operate . “They both scored from their only chance of the game against us. It’s something we have to learn in the tight games. If we do we still have a chance of a top six finish this season. There was a moment in the Millwall match when Craig Mackail-Smith delivered a perfect cross across the six yard box, but Tom was beyond the far post with no chance of getting on the end of it. “A win at Bradford would certainly give us the confidence to go on a winning run at such a crucial time of the season. “That’s what we will be aiming for. A draw would be a good result, but we need more after losing at Millwall. Beadford City last lost at home in a Football League match on March 1, 2016. The Posh run-in this season doesn’t look too taxing once they get past Bradford and Oxford (home, March 11). 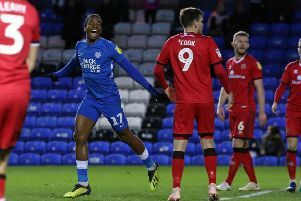 They have a home game against third-placed Fleetwood on Good Friday (April 15) and travel to fourth-placed Bolton on the final day of the campaign (Sunday, April 30), but they also have relegation favourites Chesterfield, Gillingham and Coventry City to play. Posh skipper Chris Forrester could return to the Posh starting line-up at Bradford.